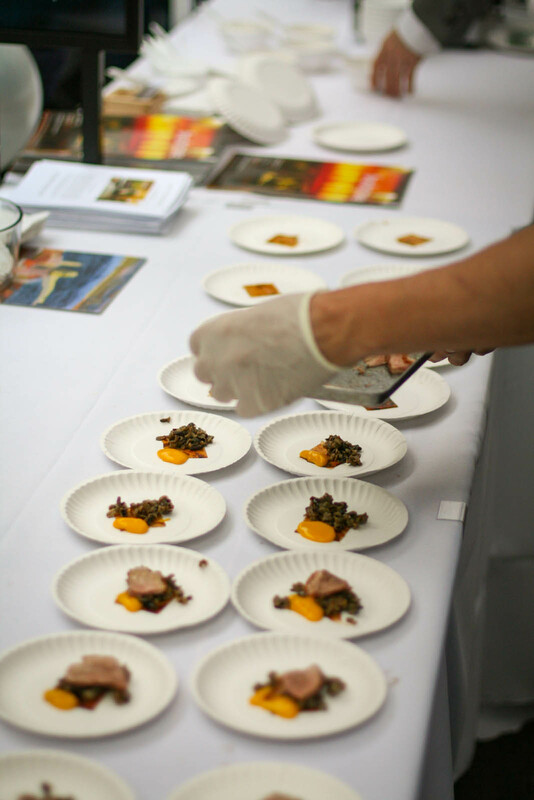 Outdoor food festival season is in full swing, and this past Saturday was Tribeca’s culinary moment in the sun when it played host to the 19th annual Taste of Tribeca food event. 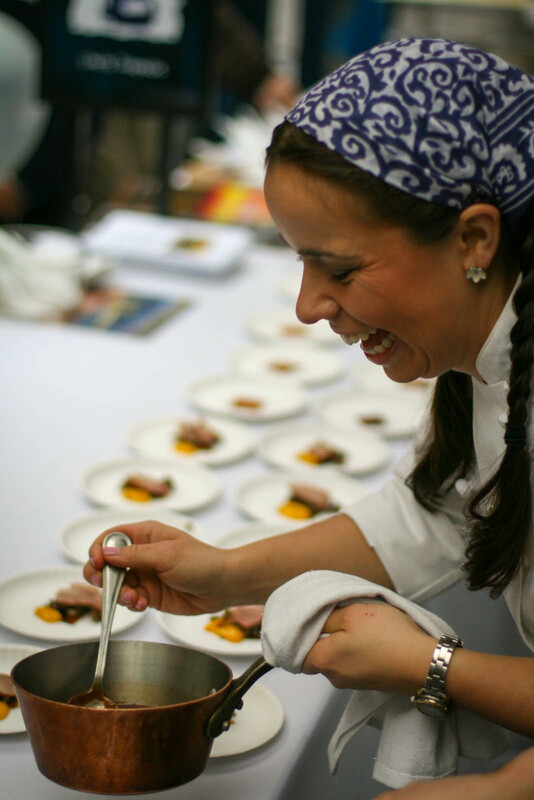 Over 70 neighborhood restaurants came out to help raise proceeds for arts and enrichment programs at local public schools PS 150 and PS 234. Many of the volunteers consisted of parents of the children enrolled at these schools, along with the cute, energetic students themselves. The strong sense of community that prevailed at Taste of Tribeca gave the event a fun neighborhood block party vibe that you don’t really find at a lot of chaotic street festivals. 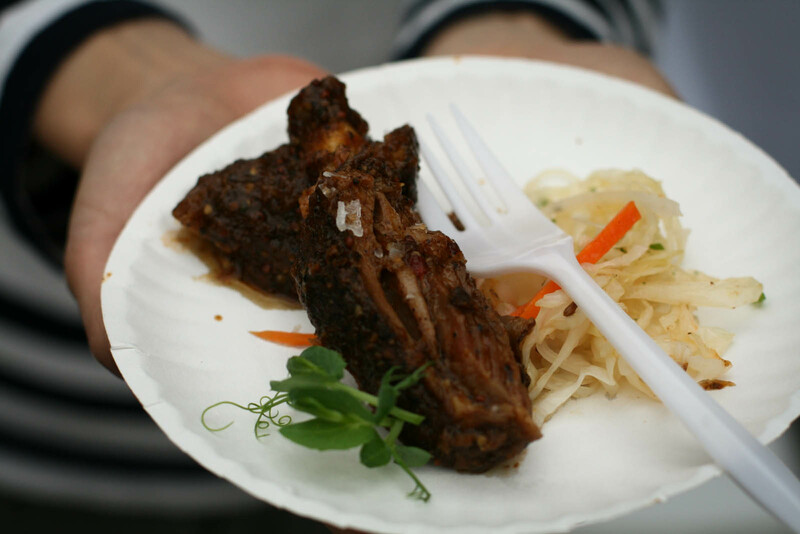 Overcast skies and eventual rainfall did little to dampen spirits, as festival goers pluckily waited in the rain to sample enticing bites from their favorite Tribeca restaurants. The Gab and Gobble team was able to eat its way through 12 of the offered bites–here’s a round-up of how each one measured up. 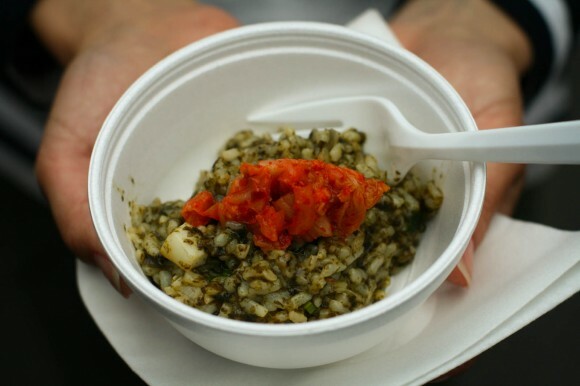 Best in Show definitely goes to Jungsik’s amazing seafood risotto. I loved the comforting umami flavors of the beef-flavored, seaweed speckled rice and the fresh chunks of seafood nestled throughout, and the kimchee on top provided a nice pickled kick. A great understated take on a normally heavy, creamy dish. Brushstroke’s luxurious egg custard dish was also an impressive effort. 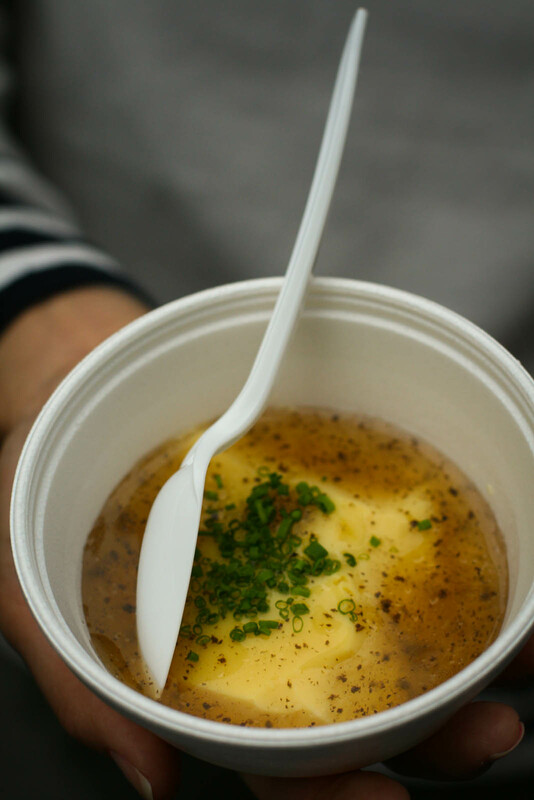 The soft and silky egg and the black truffle broth were a dreamy, decadent combination. 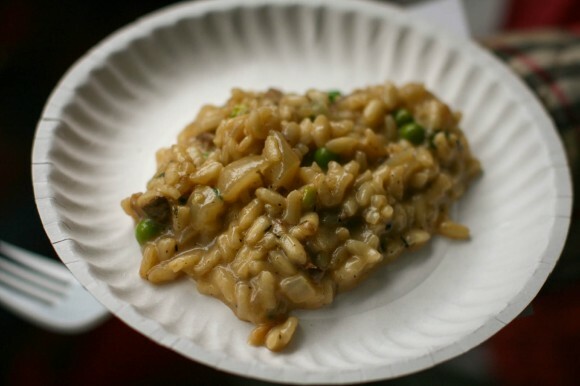 Scalini Fedeli’s dish stayed true to the hearty, rich flavors of traditional risotto. The rice was cooked perfectly and was coated in a delicious, creamy sauce. The mushrooms provided some earthy notes while the peas provided some complementary light ones. Bouley’s taste was certainly the most ambitious one at the festival. 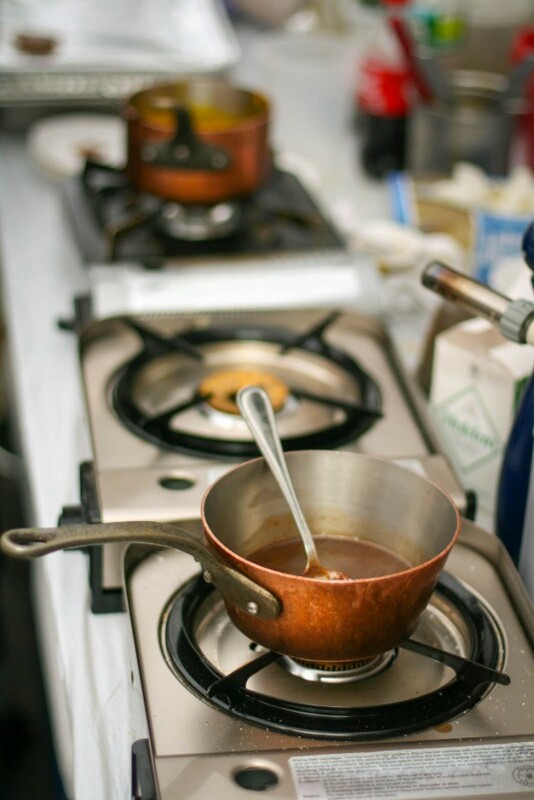 An elaborate assembly line was set up to piece together the different components of the dish. 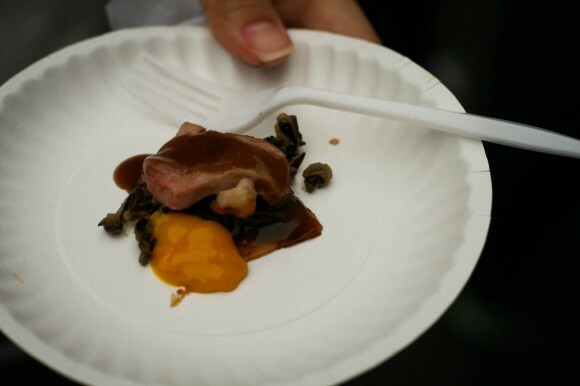 While I applaud Bouley’s efforts, I felt that the duck breast was too small and lacked flavor, and the kumquat puree was a bit overpowering and overly sweet. 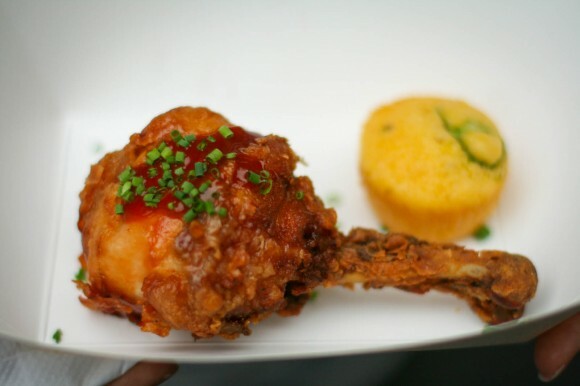 The hefty, juicy chicken drumstick was a refreshing change from the daintier tastes that prevailed at the festival. The buttermilk fried chicken was perfectly crisp on the outside but moist and flavorful on the inside. The corn bread was a little dry, but let’s be honest, it was entirely upstaged by the chicken. 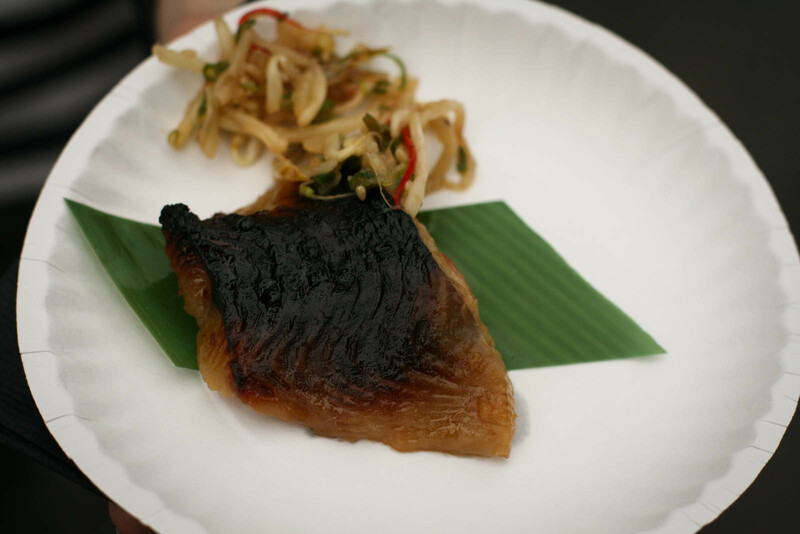 Nobu’s black miso cod is one of those legendary dishes that spawned thousands of inferior imitations. I was a little disappointed by the version served at the festival. The fish tasted like it had been cooked the night before, and the filet was extremely tough, almost smoked and jerky-like on the surface. I’m willing to cut Nobu some slack though, because I’m sure serving a signature dish to the masses in the outdoors is a logistical challenge. 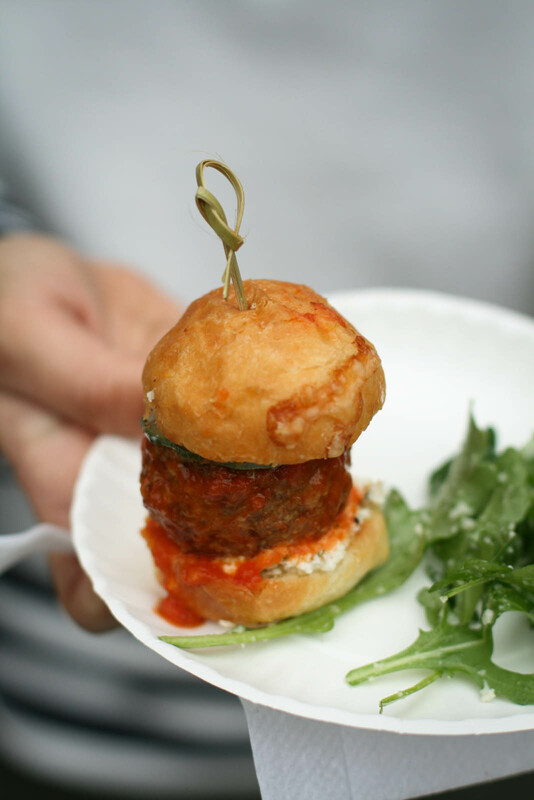 Locanda’s lamb meatball slider was very solid. The lamb patty was moist and flavorful, and the ricotta cheese nicely counterbalanced the gaminess of the lamb meat. The summer salad was a tad salty but was light and fresh. I commend Marc Forgione for ambitiously serving up lamb ribs at an outdoor festival. The ribs were marinated in a heavy spice rub that was reminiscent of smoked, peppery beef jerky. I think if there were more lamb meat on the bones, the spices would have been more balanced and less intense. The accompanying coleslaw didn’t really add anything to the dish. I honestly chose this dish because the sushi rolls were pretty generous in size, and I needed something more substantial than just a bite. Plus, I think sushi rolls were a refreshing change from the dozens of sliders and burgers that were being offered at many stands. 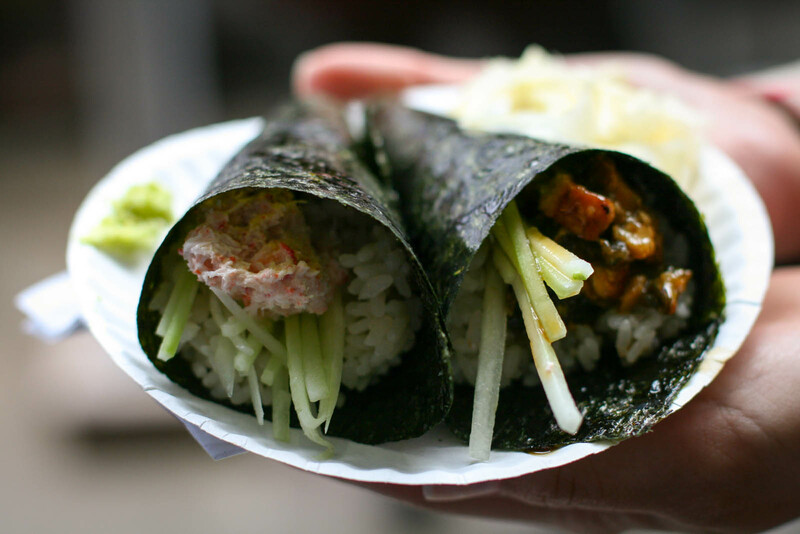 Overall, this was a solid hand roll. I’m going to keep this one short. 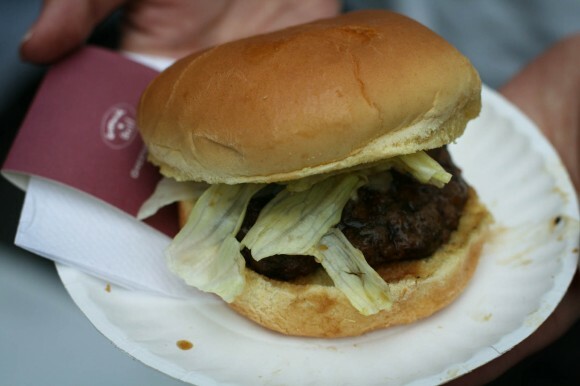 I hope this burger is in beta mode, because the restaurant needs to work out a lot of kinks. The Odeon played it smart and operated an ice cream stand at the festival. 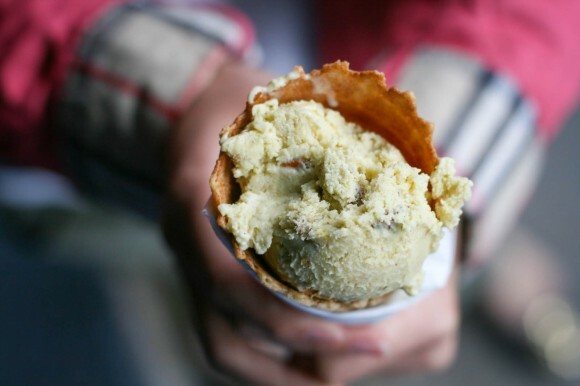 Ice cream is always a crowd favorite, and not surprisingly the demand for this sweet treat was high. The pistachio was creamy and delicious, and there were generous chunks of nuts mixed in throughout. We finished off the day with a generous portion of Bubby’s delicious fruit crumble. 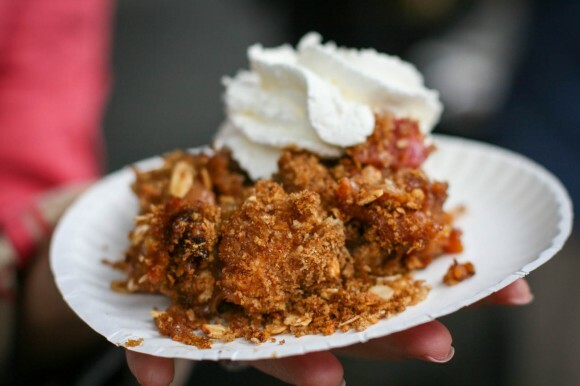 Nothing says summer like fresh apples and rhubarb served with a dollop of fresh cream! © Copyright 2013. Gab and Gobble. All Rights Reserved. Design by Bloom.